Weavers Srinivasa Vishwanath, the Convener of Weavers United Front of India, expressed his disagreement over the handloom sector in the Union Budget. The budget is Rs. 396 crores only to be blamed. The handloom workers were hoping that justice would be done in the budget for the country's heritage, but the Center had floated on their hopes. In the budget of 2016-17, The budget allocated Rs 710 crore and allocated Rs 604 crore in the 2017-18 budget to Rs 106 crore, and the allocation in the new budget for the next year is very deteriorating, "he said. Such rumors on handloom sector and handloom workers are worth it. The handloom sector has been stripped by the decaying allocation. There is about 4 crore live and 15 crores indirect lives in this sector. About 3 lakh people live in Andhra Pradesh and 8 lakh are indirectly employed. Last year, the GST on the handloom sector had reduced employment and handicrafts, weavers and jobs. Now, the Union budget has allocated some funds for handlooms and weaved the handloom sector. 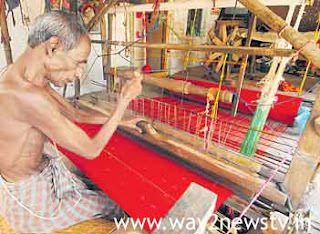 There are serious losses in the handloom sector due to government policy deficiencies. The lack of co-operation from the government and the weaving of garments did not get the price of handmade workers recalled cases of suicide. In the ongoing 'vote on account', the center demanded that the Center provide allocated funds. Recognizing the unfairness of the handloom and increasing the provision of the government, we want to ensure the integrity of the government. Vivekanand said that the Wehrars United Front meeting on the unfairness of the budget will be discussed and acted in a deep discussion.